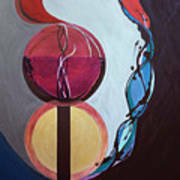 Havdallah...separation is a painting by Marlene Burns which was uploaded on January 12th, 2010. �Blessed are You, O Lord, our God, King of the universe, who creates the fruit of the vine. Blessed are You, O Lord, Our God, who creates the species of fragrance. Blessed are You, O Lord, Our God, who creates the illuminations of the fire. This image is an expression of the blessings of Havdallah, said at the end of the Sabbath to acknowledge the conclusion of the holy day. Havdallah means separation. The holy day of rest, that God gave us is separated from the rest of the secular work week (as represented by the fire). The wine, the spices and the fire are blessed in addition to the acknowledgment of the separation. A tri-wicked candle is used and its image can be seen in the braided lines of blue. The braided design is repeated as the fragrance from the spices flow up through the heavenly realm, to God, signified by the red color. 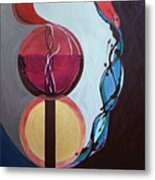 The shape of a wine goblet anchors the center of the painting just as the Kiddush blessing over the wine anchors so many of our celebrations and holy days. The two circles represent our soul and the added soul we receive for Shabbat to aid in our spiritual journey. At Havdallah, we say goodbye to the second soul. Toby, thank you for the feature in your new group! Still as Beautiful as ever! Just as an painting - with no references - this is very a fine piece. I would have been thinking of things like DNA and conception I guess. I'm not saying this to detract from your symbols and explanation - just noticing that the painting is beautiful purely on its own. 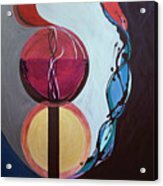 Another flowing work with special meaning. This is wonderful miss M.
Awesome and awe-inspiring work Marlene. The colors and composition are so moving and dramatic. Gorgeous! Looks like you took a double break. Strong painting with lots of symbolism. Its terrific M.. you really put a lot of thought into your works!